The ship week for my two subscription titles was the same this month, so they came in like a one-two punch. First to arrive was this issue of FLASH. Rich Buckler had by this time become very much the go-to artist for super hero covers in the DC stable, a step up from Ernie Chan/Chua. But it must be said, Buckler did some strange compositions and some odd figures. I can only assume that he was being art directed or working from cover sketches done by other people in some instances. Also, the fact that this was a subscription copy helped to disguise the fact, but another Rubicon had been crossed. This was the very first comic book that I owned that carried a 35 cent cover price, a whopping increase of 15 cents from when I began reading only four years earlier, practically double the price. In the 1970s, we became attuned to the frequent uptick of cover prices every 18 months or so–you could almost feel them in the offing as they approached. But they were never welcome, none moreso that this–this was the one that meant that you couldn’t buy three comic books for a buck any more, you needed an additional 5 cents. Not always an easy thing to come by. So what was up in the world of the Scarlet Speedster at this point? Well, a new member of the Rogue’s Gallery for one–the Golden Glider, who shared an association or two with established villains, as we shall see. 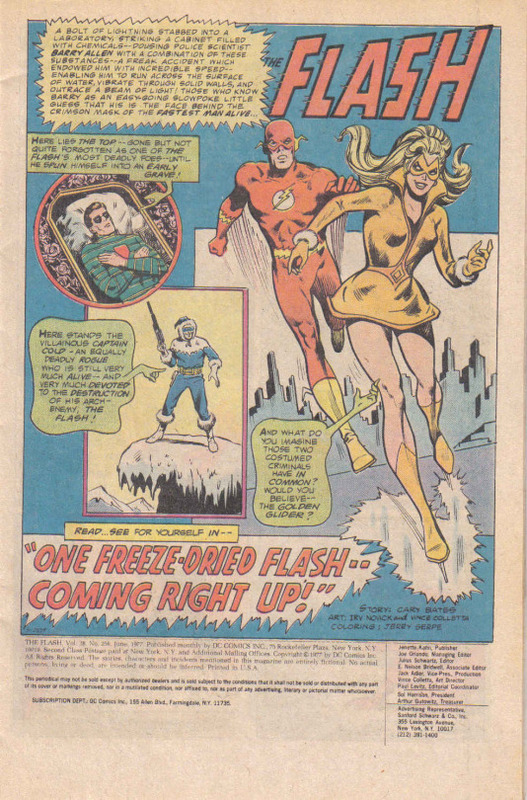 Writer Cary Bates’ title and the main weapon employed by Captain Cold in this story revolve around a much-touted new method of food preservation, but I had never heard the term freeze-drying before I read this story, so it was all new to me. …it turns out that Lisa Snart was not only a figure skater but also the paramour of the now-deceased Flash villain the Top. 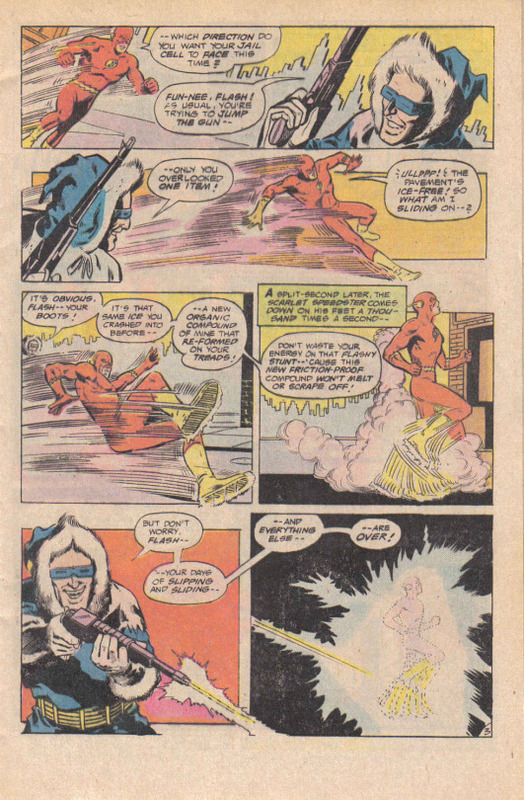 Roscoe Dillon had lost his life through trying to increase his powers while combating the Flash. 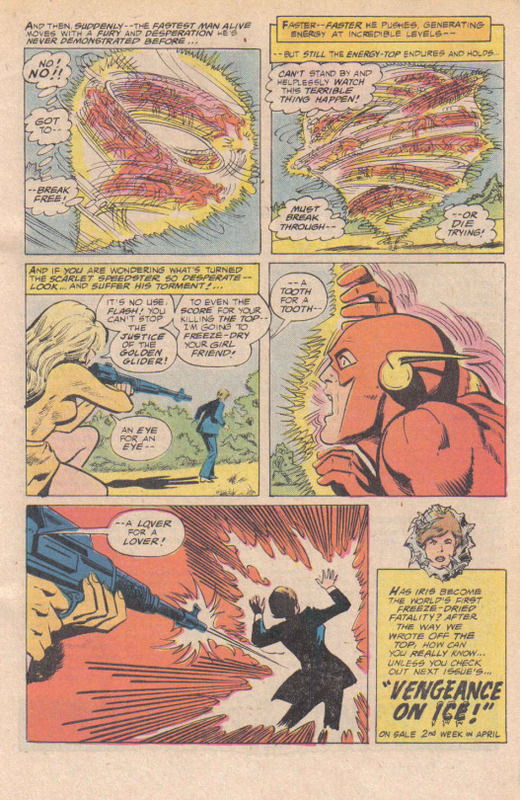 So Lisa, as the Golden Glider, has vowed to kill the Flash’s loved one before eliminating the speedster–and she again fouls up Captain Cold when he’s got a lethal shot at the quick-moving hero later on. She leaved Cold to be taken into custody by the Flash, but makes off with his Freeze-Drying Gun. Later on, there’s personal drama coming to a head, as the still-amnesiac Daphne Dean once again lip-locks with Barry at home. But she hasn’t reckoned with the investigative prowess of reporter Iris Allen, who shows up to expose Daphne’s scheme–she’s been pretending to have lost her memory and playing up to Barry at the behest of her manager so that she could win an upcoming film part. Exposed, Daphne offers some shoddy apologies and begins to pack up to leave. 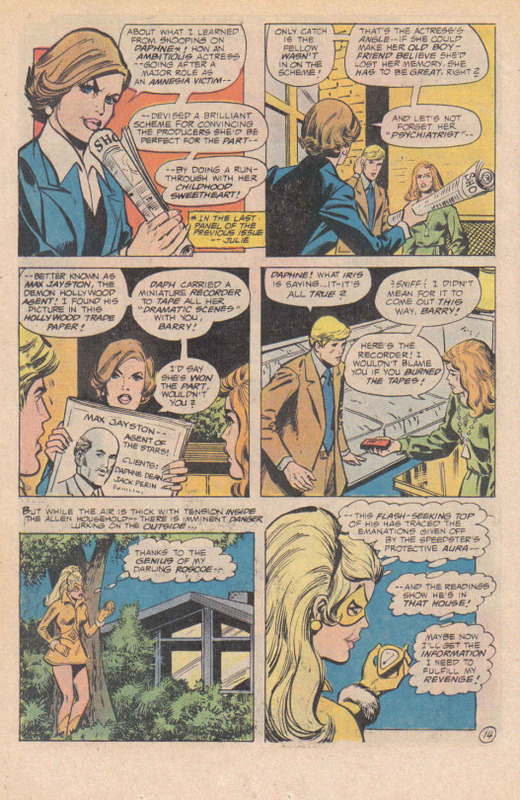 Iris also storms out–which is bad news, because the Golden Glider has been able to follow the Flash’s vibrational trail to their neighborhood. So when Barry as the Flash races out to intercept Iris, the Golden Glider sees them talking and now has her target. 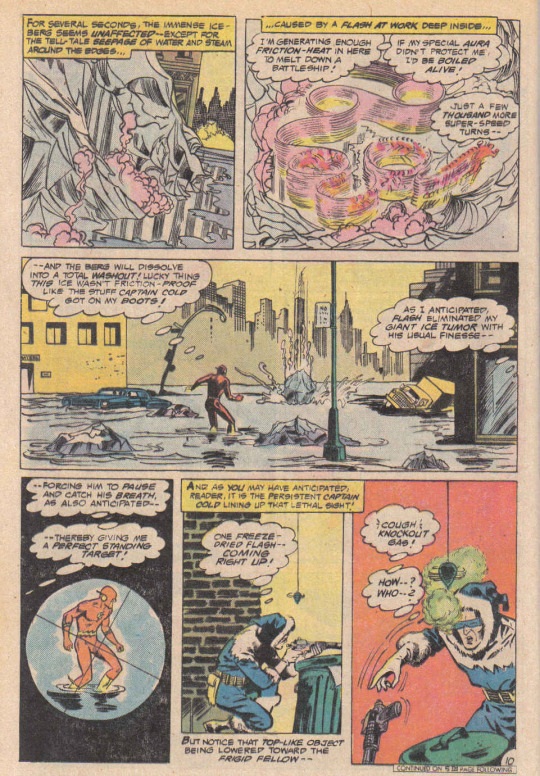 Using weapons left over by the Top, she manages to trap the Flash inside a top-shaped energy cocoon, unable to interfere as the Golden Glider coolly guns down Iris with Cold’s Freeze-Drying weapon! Ah, if Barry only knew that he could “Flashpoint” his way out of this predicament by going back to the past and changing time. But instead, we leave matters To Be Continued until next month!